but I have to believe in the cause. The portrayal of politics in The Ides of March (its title an overt reference to the betrayal and assassination of Caesar) is unrelentingly cynical, but it has little need to convince its audience: while the twists and turns of the plot are compelling, there is no shock or disbelief because this world is so instantly recognisable in its realism. 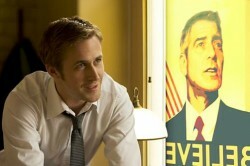 Stephen Myers [Ryan Gosling] is an idealistic staffer on the Presidential campaign for Governor Mike Morris [George Clooney] in the Democratic primaries. With only two candidates still in the running, Ohio is the crucial state that will decide the race, but Morris refuses to compromise on his principles by making deals to win. Myers finds his own integrity tested as the campaign continues. Many will mistake this for a political film when really its focus is on single character’s struggle with integrity set against a political backdrop, perhaps highlighted best by a shot of Myers’ small silhouette against the backdrop of a gigantic US flag. There is no strong political message here — the campaign is between two Democrat senators; comments on the Republicans are merely asides. Images such as a Shepard Fairey inspired campaign poster for Morris are more to ground the proceedings in the present day political atmosphere than to designate targets. Notably the source material, Willimon’s play Farragut North, was based on the 2004 primaries and not the Obama campaign. Instead this is a powerful thriller with not a single bullet fired, yet many scenes have a heightened intensity as a result. One lingering exterior shot of a van — we know the conversation ongoing inside though we are not privy to the dialogue — is as taut as any execution scene and in its precise construction we half expect to hear a muted gunshot accompanied by a cloud of red mist. To cultivate this atmosphere without need for violence or exploitative tricks is a testament to Clooney’s assured, yet understated, direction. The central cast is incredibly strong and all turn in excellent performances. 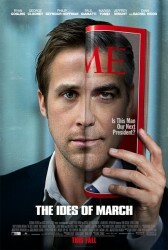 Gosling has the most nuanced role even if his character’s shift is ultimately in a single direction. Meanwhile the rest of the cast tend to be reacting more to the machinations of others. 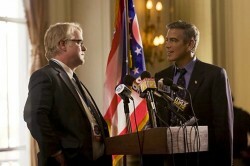 Clooney oozes crowd-pleasing charm, while Hoffman and Giamatti make great rival veteran campaign managers with differing styles, one prizing loyalty while the other is more jaded. Wood may be the least prestigious name amongst the leads but her ability to switch between seductive confidence and vulnerable naïveté sells her character. Ultimately, while non-partisan, The Ides of March is still a scathing condemnation of the political process, moreso because we are treated to the damage caused on a personal level as well as the overarching hypocrisy. The latter will not surprise the audience, but the former still brings home the message in a powerful fashion.